Today’s the last day you can pre-order a signed and numbered, limited edition hardcover copy of The Lair of the Clockwork Book through my fund raising drive at Kickstarter. Don’t be the last one on your block! The number of copies in the limited edition depends on the number of backers who pre-order the book at the Kickstarter site. So until 7PM Eastern Time you have the ability to devalue them by pre-ordering a hundred or two! 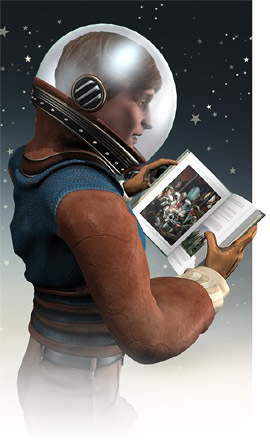 Think of the consequences to the world’s literary standards! If you do miss out, you might be consoled by the knowledge that there will also be a paperback edition available from Amazon and from the Thrilling Tales of the Downright Unusual web site – soon, or soonish, probably in early April. In addition, any overruns from the limited edition’s printing will become a small open hardcover edition, available only from the Thrilling Tales site. 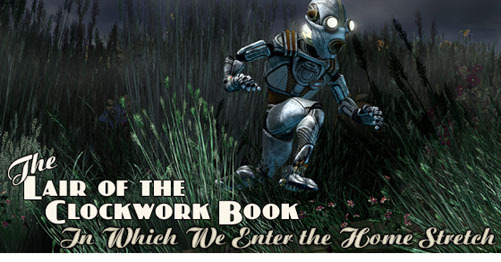 Thrilling Tales – The Clockwork Book meets its funding goal! Yesterday was another eventful day for The Lair of the Clockwork Book‘s Kickstarter fund drive. I posted a new update there, in which I did a much better job of explaining why this project is structured a bit differently from most Kickstarter projects, and then at around 10:30 PM EST the project achieved its goal. This was a bit surprising. I had an idea that it would get fully funded sometime today, but things accelerated during the evening. It’s still not over, though! I’ve got another 31 hours to attract some more of the Internet’s fleeting interest and find good homes for a few more of these handsome books. As I was gathering my thoughts for that update I found some interesting comparisons between this, which is effectively a book pre-order, and my last Kickstarter project, which looked far more normal but had its own dark secret. This might be interesting to nobody but me. Still, once the dust has settled I may write those thoughts down for the blog. Anyway I continue to drive traffic to Thrilling Tales of the Downright Unusual and to the Kickstarter page in these final hours, while I’m still occupied with the final illustrations for the book. I discovered a couple of days ago that I’d never assigned a number to one of these last chunks of story, and that means I need one more picture than I’d realized. Kickstarter Update – and a $1000 matching pledge for today! 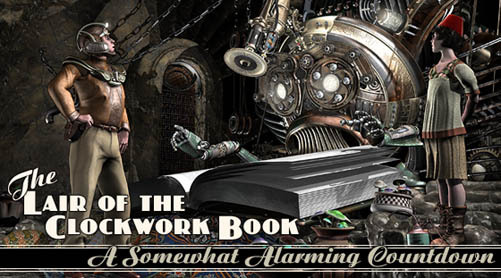 With five days and and an uncomfortable 43% of its funding left to go, I’ve posted a new update at the Kickstarter project page for The Lair of the Clockwork Book‘s limited, hardcover print edition. Just as this update sank in, one Kickstarter backer who is not confined to an asylum* has offered to increase his pledge to $1000 – but only if we raise $1000 today. So if the total reaches $5358 by the end of the day, he’ll bump it up to $6358 – which is 81% of the total we need to raise. Go, Internet! *I don’t actually know this.